Within an hour's drive of interstate 25 south from Denver, Colorado Springs, Pueblo, Walsenburg, Trinidad, and toward New Mexico, you will find the best hiking trails in all of Colorado. 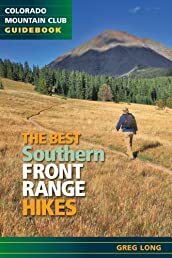 The Best Southern Front Range Hikes includes 65 of the most superb hikes found anywhere in the state. The hikes were chosen for a number of reasons, including the beauty of the scenery, the variety of terrain, the quality of the hiking experience on the trail, and the fact that many of these trails don't get used as much as the trails in other parts of the state. Some are close to town while others are more remote. Many make excellent family outings while others challenge the seasoned mountaineer. All can be done in a day from at least one of the cities listed above.